This simple Key Turner has been designed to hold a single key safely and securely, making it much easier to use and control. 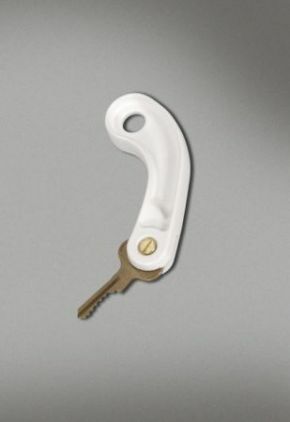 The simple white nylon shaped key handle has a generous curved built-up handle, that provides an easy, secure grip on the key. Ideal for those with a weak grip or those who suffer from Arthritis or tender joints. To be used with a single Yale or Mortice type door key, that is held in place with a brass screw fitting. Having Rheumatoid Arthritis this Key Turner has made life a little easier opening doors.........I am so pleased with this purchase I am going to order the double Key Turner. Absolutely brilliant device, I can now open my front door with ease. Thank you very much, I like it so much I am buying one for my neighbour who also suffers from arthritis and has the same problem as I do. Excellent. Extremely easy to use.